The Riga Latvian Society’s chamber choir "Austrums"
The Riga Latvian Society’s chamber choir „Austrums” was founded in 1987, and since its beginnings the choir’s artistic leader has been Ārijs Šķepasts. Since 2005 the choir’s conductor is also the young and perspective student of the Jazeps Vitols’ Latvian Academy of Music Pēteris Vaickovskis. The regular singers of the choir are 35 people at the age from 16 till 45 years. 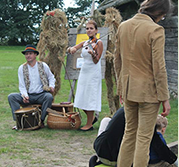 „Austrums” participates regularly in festivals and gives concerts in different Latvian towns, singing in churches, music schools and culture centres. The chamber choir includes in its concert programmes different style’s compositions, paying particular attention to the Baroque music, Latvian choir music’s classic, 20th century music and Latvian folk music arrangements. The choir’s singers choose the repertoire also themselves. Ā.Šķepast’s emotionally expressive arrangements and original compositions have become the brand sign of the choir that often surprise the listeners with unusual expressive means – nature sounds and untraditional instruments. Several choir’s musical projects have become the annual traditions. Within the framework of Easter concert programmes, „Austrums” has developed several big forms for choir and double choir in cooperation with such choirs as „Sōla”, „Jumprava” (Maiden) and Jelgava St. Anna churce’s mixed choir. Each year in February the choir, together with Liepāja’s youth choir „Intis”, make common musically dramatic performance that is devoted to some Latvian poet’s love story. The concert cycle “Music in European Kingdoms” is very important event in the choir’s life that is well-known with its Baroque opera’s renditions and cooperation with outstanding Baroque musicians. The choir „Austrums” is characteristic for the determination and seeking for challenges that are implemented by participating in prestigious international contests and festivals, where the choir has often received the highest evaluation.